This photo was taken on the dance floor of Sara and Zach's wedding at the General Lewis Inn. Dance parties at weddings are hit or miss, but this one was a hit as both the bride and groom were on the dance floor for nearly the entire time their band played. It certainly helps the energy of a wedding when the bridal party participates on the dance floor! It can be challenging to get a good dance floor photo as it's usually dark in the room and things are moving quickly. So I especially proud of this photo as it combines nice light, a strong emotional element, and excellent composition. 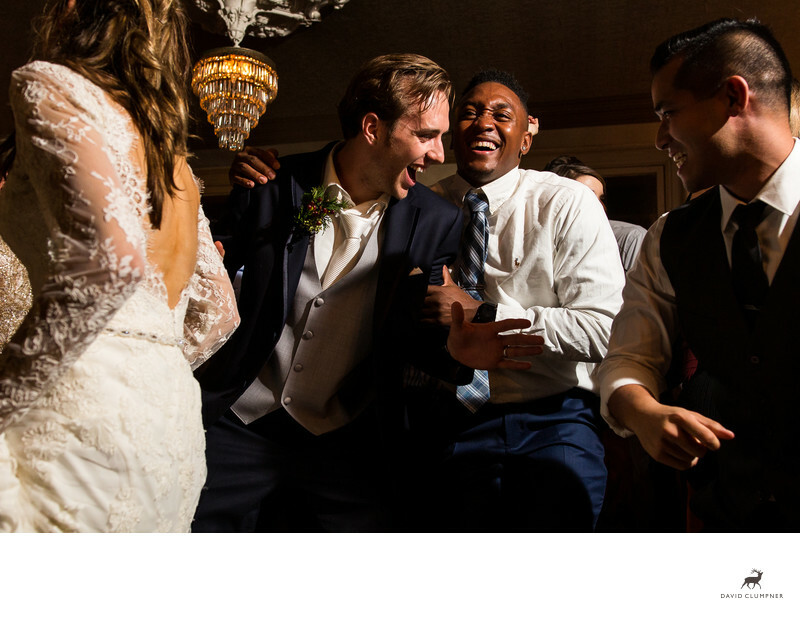 The groom and his groomsman are interacting in a very masculine fashion while a smiling guest completes the scene on the right and the bride is exiting the frame to the left. The ceiling light just happens to perfectly fill in what would otherwise be a black hole on the ceiling. Everything works so well in this frame and it gives me hope that one day dance images can be a strength of my portfolio! Location: 301 E. Washington St., Lewisburg, WV 24901.